It'll view almost any resources (including sound resources!) from pretty much any SCI game out there. Straight from King's Quest IV all the way up to Torin's Passage, LSL7, Phantasmagoria I believe, and others. 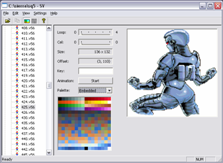 This is a powerful tool for developers because it has several features that neither SCI Studio nor SCI Companion have. The biggest one is the ability to preview sound resources. You can choose which PATCH to play them through (Tandy 3-voice, Adlib, Sound Blaster, MT-32, General MIDI (if the game supports it), PC Speaker, or even digital sound (again if the game or sound resources supports it) and after that you can choose which Windows MIDI interface you want to output it through. It also includes the loop trigger feature. Some sound resources in SCI games contain loop triggers that are used in conjunction with the game scripts to loop certain parts of a music theme while the game is busy doing something. Then when the game is finished it usually calls another sound resource and plays it. You really get the feel for how Sierra used their sound resources to their advantage. Almost as well as iMuse in LucasArts games. You can also save sound resources as MIDI files and save the digital audio sound resources as WAV files.